The study unveils the PGC-1a gene as a critical factor in maintaining bone-fat balance in the bone marrow. In aged and osteoporotic bone, the amount of PGC-1a decreases dramatically, leading to less bone and more fat formation in the marrow cavity. In an unexpected discovery, UCLA researchers have found that a gene previously known to control human metabolism also controls the equilibrium of bone and fat in bone marrow as well as how an adult stem cell expresses its final cell type. The findings could lead to a better understanding of the disruption of bone-to-fat ratio in bone marrow as well as its health consequences, and also point to the gene as a promising therapeutic target in the treatment of osteoporosis and skeletal aging. Until now, the PGC-1 gene, a gene activator, was primarily known to regulate reactions that convert and sustain energy for human cells. The study — led by Dr. Cun-Yu Wang, chair and professor of oral biology and medicine, and Dr. Bo Yu, assistant professor of restorative dentistry, both from the UCLA School of Dentistry — has shown that PGC-1 may actually impact whether stem cells turn into fat cells or bone marrow cells and in turn control the bone-to-fat balance in bone marrow. The research is published online in the journal Cell Stem Cell. Bone marrow tissue is composed of blood cells, marrow adipose tissue (or fat) and supportive stromal cells (connective tissue cells of any organ). For years, clinicians have noted an inverse relationship between bone mass and fat cells in bone marrow in various medical conditions. An increase in marrow fat is often accompanied by a decrease in bone mass in aging as well as osteoporosis and other metabolic disorders. Osteoblasts, or bone-forming cells, and adipocytes, or fat-forming cells, derive from a common pool of mesenchymal stem cells, which are stromal cells that can become several different types of cells. This composition suggests a tradeoff between the two cell types and an abnormality in how a cell expresses its final type of mesenchymal stem cell in skeletal aging and osteoporosis. The molecular basis of this phenomenon is poorly understood. Further study of and insights into the inverse relationship of bone loss to fat formation may lead to new treatments for these conditions. Wang and Yu noticed in both human and mouse bone marrow that the expression of the PGC-1 gene decreased dramatically with advanced age. The researchers initially wanted to better understand the role of this gene in age-induced bone loss. The pair began their study by creating a mouse model that had the PGC-1 proteins removed from mesenchymal stem cells. They found something unexpected when these mice underwent a procedure that simulated osteoporosis — there was a significant increase in marrow fat along with the expected decrease in bone mass. "What we found was particularly intriguing, given that PGC-1 has previously only been linked with metabolism but not with adult stem cells," said Wang, who is also the dental school's associate dean for graduate studies. "This revelation suggests that PGC-1 could influence how stem cells differentiate into bone and not fat cells, and it could also lead to new therapeutics in osteoporosis." To test their findings, they created a mouse model in which the PGC-1 gene expression was increased. What occurred was the opposite of what happened with their first model — there was a slowdown in bone loss and a decrease in bone marrow fat, which suggests that PGC-1 may play a protective role in maintaining the bone-to-fat balance. 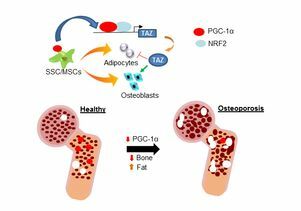 The team found that PGC-1 directly activated the expression of TAZ, a master regulator previously reported to promote bone formation while inhibiting fat cell differentiation of mesenchymal stem cells. "You could compare PGC-1 to a river that nourishes or maintains bone mass as it winds through the marrow landscape," Yu said. "The river runs dry as we age, prompting more fat cells to form at the expense of bone." Physical exercise has been found to induce PGC-1 expression. This study also suggests that regular physical exercise might help to maintain bone health and prevent skeletal aging, as well as provide other health benefits. Wang holds the Dr. No-Hee Park Endowed Chair in Dentistry, funded by the Shapiro Family Charitable Foundation, and is a member of the UCLA Jonsson Comprehensive Cancer Center and UCLA Broad Stem Cell Research Center. Additional authors are Lihong Huo, Peng Deng, John Szymanski, Jiong Li and Dr. Christine Hong, all from the UCLA School of Dentistry; Yunsong Liu from Peking University School of Stomatology; Xianghang Luo from The Second Xiangya Hospital of Central South University; and Jiandie Lin from the University of Michigan. The study was made possible in part by funding from the Ming Hsieh Family Foundation; the National Institute of Dental and Craniofacial Research; the National Institute of Arthritis and Musculoskeletal and Skin Diseases; and the National Center for Advancing Translational Sciences. The authors report that they have no commercial conflicts of interest.